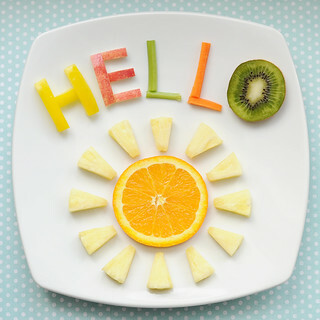 Cute Snack Idea: Hello Sunshine! Although some days it seems that Mother Nature can’t make up her mind, spring is inevitably on its way. I am so ready for the snow to melt away and for sunshine, rainy day showers, and new life to start blooming. I whipped up this really easy fruit and veggie snack for the kids this weekend to help welcome spring. I think it turned out pretty cute, if I do say so myself. It didn’t require any special tools (except a sharp kitchen knife) and it’s loaded with healthy vitamins and nutrients. 1. Place your orange slice on the bottom half of a plate for a sun. 2. Using your kitchen knife, slice your pineapple ring into small triangles. Place these triangles around your sun. 3. Grab your strip of yellow pepper and slice into 3 pieces to make the letter H. Place these on your plate. 4. Grab your strip of red apple and slice it into 1 larger and 3 smaller pieces to make the letter E. Place these on your plate. 5. Take your strip of celery and cut into 1 longer and 1 shorter piece to make the letter L. Place these on your plate. 6. Take your strip of carrot and cut it just like you cut your celery strip above to make another letter L. Place these on your plate. 7. Finally, grab your slice of kiwi and stick it on the plate for the letter O. This little snack is so bright and colourful, it will make anyone excited for spring! Goodbye winter and hello sunshine! Jill Dubien is a working mom who loves to craft and cook with her kiddos in her spare time. She has an awesome and supportive husband and 2 wonderful kids—a daughter who is 4 and a son who is 3. Before she had kids, Jill couldn’t cook much of anything except toast and cereal, and really despised being in the kitchen. Jill blogs at Meet the Dubiens, where she shares lots of fun foods and crafts for kids. You’ll find more of her cute recipe ideas here. This is a clever way to get the sleepy heads bright up in smiles. :D Thanks for a great tip, Jill!